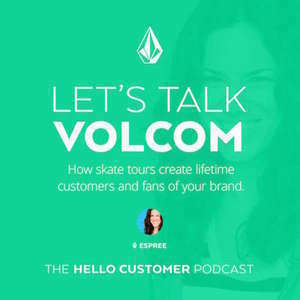 When it comes to customer experience, Volcom positions itself as a brand that supports athletes from the smallest — and youngest — levels all the way up to the top. With their Let the Kids Ride Free programs, the brand tours the globe hosting contests for snowboarders with no entrance fees. Giving youth the chance to experience camaraderie with each other, meet their snowboarding idols in person, and gain confidence on each course is the priority. In fact, Volcom marketing representative Brandon Janssen was once just a kid in Minnesota, who grew up with the competitions and developed such a strong relationship that it evolved into his career. Volcom invests in young athletes, and connects personally with many of the faces they meet along the tour year after year, like Benny Milam, a snowboarder from Minnesota that started as a kid with basic tricks and is now so advanced he’s on the amateur Volcom team. Across the board, Volcom doesn’t shy away from the small action, but instead, embraces it. It’s the little moments — the “Hey, want a hat?” or “Wow, that contest was so fun” — that lead to big-time loyalty. From the get-go Volcom has been a supporter of music, film, and art because they see their board sports as a different form of self-expression. The brand positions itself as “spiritual intoxication,” supporting the journey of board sports and helping consumers feel connected to the earth. In 2000 they hosted their first contest at Mammoth Mountain, and it’s grown into a global tour of contests and events. The Let the Kids Ride Free contests offer a chance for young athletes to meet their pro heroes, develop camaraderie with each other, get competition experience, and gain confidence. Kids growing up with the Volcom events develop brand loyalty (like Brandon, who started as a youth competitor and now works for the team).